With a visit to Portland’s Providence Park in August, I joined a fairly small club — the club for people who’ve attended a match at every active MLS stadium on the west coast. Most PSP readers and Union fans aren’t based on the west coast, and a jaunt out to any of the six venues on the list to watch the Union (or just a regular match) is more likely to be a vacation than a day trip. With that in mind, I thought it would be helpful to provide a guide that would help a Philly-based fan plan their trip west for soccer. Just because they’re last on this list doesn’t mean that an Earthquakes game isn’t worth watching, but they’re a bad team saddled with a tough location in one of the densest metropolitan areas in the country. I cannot in good conscience recommend visiting Avaya Stadium if you only have a couple days in the Bay. But, if you do go, here’s how you should do it. Access: Trying to drive anywhere in the Bay Area will make you feel like you’re in the bad place, so where you’re staying and how you get around will really determine your approach. I’m partial to the East Bay (Oakland and Berkeley), but the only real way to get down to San Jose is by car. San Francisco has better public transit links (CalTrain), and it’s one of the world’s great cities. Either way, you’ll need to plan at least an hour and a half to get from wherever you’re staying to Avaya. This is easily the biggest strike against the Earthquakes’ setup. Things to do: You could also keep it local and see all that San Jose has to offer! I do not advise this. The most distinctive feature of San Jose is the airport, which is right next to the stadium. This is easily the biggest strike against the Earthquakes’ setup. Pro tip: the nearest In-N-Out burger is located an easy ten minutes from the stadium by car. The game experience: This really varies depending on the occasion. 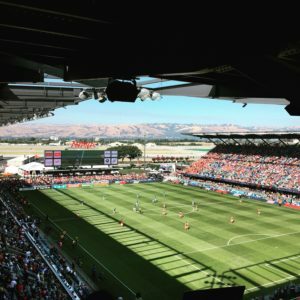 I’ve covered both an MLS All-Star Game and a World Cup qualifier at Avaya, and the atmosphere at both were really good. The stands are steep and keep the sound enclosed, and the stadium is small enough that things feel intimate. There’s also one of the longest bars in North America running across one end of the field — watch out for flying balls during warmups, though. You’ll notice that the San Jose Earthquakes were not involved in either of the aforementioned matches. Unfortunately, the Earthquakes are almost unfathomably bad at soccer. The vibe for the Union match I covered there (the match where Conor Casey made me eat my words) didn’t set the pulse racing. This is easily the biggest strike against the Earthquakes’ setup. I recommend everything about Vancouver except the soccer. Access: Vancouver is located in Canada, which is a different country from the United States. (Citation needed.) Fortunately, the border is very easy and getting into downtown is similarly simple. The real advantage of Vancouver is the weak Canadian dollar. Weak in terms of value only — their “paper” money is actually made of plastic and, as a consequence, is quite strong. You’re getting, in effect, 25% off every list price thanks to the exchange rate, so that will somewhat mitigate the cost of traveling out that way. It made it really easy to rent a car (something like $35 total for two days), though Vancouver also has excellent public transit. If you’re staying anywhere near downtown, getting to BC Place is straightforward. Things to do: The two must-see places in Vancouver are Stanley Park and Granville Market. Stanley Park is located in the north of Vancouver Island and is a magnificent urban park. You can walk, bike, or drive around its perimeter and take in spectacular views of both mountains in ocean. (Stay away from the mud, though.) Granville Market is located on an island in the harbor, and is kind of like if you took Reading Terminal and stretched it out to cover a smallish island. Take the ferry from Vancouver for the full experience. Vancouver also has a very walkable LGBT-friendly neighborhood centered on Davie Street. 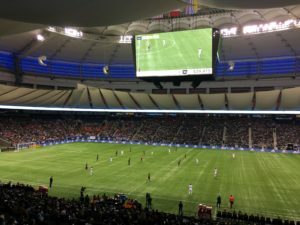 The game experience: Despite recent renovations and hosting the most important match in recent U.S. Soccer history, BC Place isn’t really a soccer stadium. Much like Gillette Stadium or CenturyLink Field, the primary tenant is a football team — the BC Lions. The Whitecaps use a series of tarps to reduce capacity to a manageable level for MLS matches. It’s also one of the few MLS stadiums with a retractable roof. When the roof is closed, it’s pretty gloomy inside. I was there for the season opener in 2017 and expected a bit more pageantry for a new season, but it turned out to be a fairly dour match. There’s not a lot inside the stadium and I wouldn’t worry too much about getting there early for the atmosphere. Only one team in MLS features the smooth stylings of Zlatan Ibrahimovic. Things to do: There’s not all that much going on in Carson. 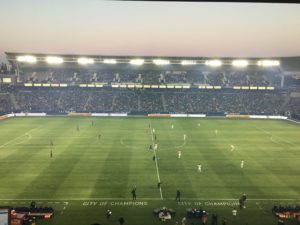 Thankfully, there are one or two other things that you can do in the sprawling metropolis of Los Angeles, as long as you build in plenty of time to fight traffic to get to the stadium in time for the match. My personal favorite stop in LA is the J. Paul Getty Museum, an eclectic collection of art housed in one of the most spectacular campuses in America. From its perch high atop the hills north of the city, the views you get at the Getty are incredible and well worth the trip. The game experience: The newest wave of MLS stadia — think D.C. United, LAFC, and the upcoming Minnesota field — are focused on intimacy. The capacity is tight, the seats are close to the field, and the stands are shockingly steep. Bottom line: unless you’re a die-hard fan of Mr. Ibrahimovic, you’re better off planning an LA trip around a visit to Bank of California Stadium. It’s always good to take a trip to the town where soccer was invented and perfected. Sarcasm aside, Seattle is genuinely a great town and a wonderful atmosphere for soccer. The only thing keeping a Sounders match from being higher in these rankings? They play in a football stadium. Access: You can do just fine without a car in Seattle. Sea-Tac airport is connected to downtown by a fairly efficient light rail connection, and the heart of the city is within walking distance of CenturyLink Field. 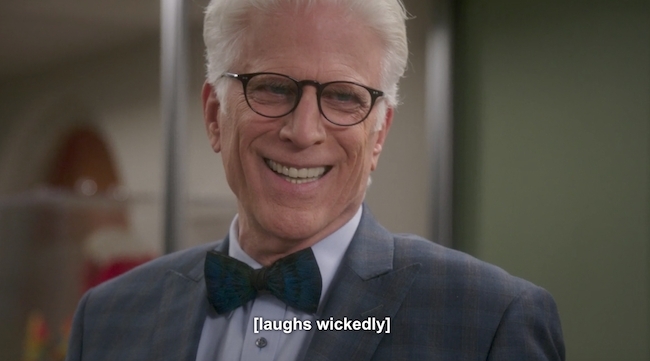 Of course, I had the glorious luck to be in Seattle on two separate sunny days. Given that Seattle is generally quite drizzly, you might not want to be strolling around all day long. If you wish to drive to Seattle from San Francisco for some reason, be aware that it is a twelve-hour drive. Though parts of it are pretty scenic, I seriously do not recommend this plan. Just fly to Seattle. Things to do: Have you ever been watching a sporting event involving a Seattle team and seen stock footage of some guys tossing fish around like they’re basketballs? You can see it in action at Pike’s Place — primarily a massive fish market, but also home to all manner of smaller retailers of food and other stuff. (The Pike Brewing Company nearby makes some killer crab chowder to go with its craft beers.) It’s also worth squeezing in a visit to the Museum of Pop Culture, right next to the Space Needle. The building’s architecture is wild, and the inside is pretty good too. You can easily entertain yourself all day while waiting to stroll over to the game. 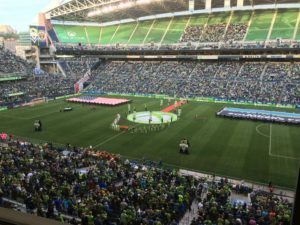 The game experience: I am loth to give any credit to Sounders fans because they can be so deeply annoying, but there’s no denying their insane passion. You should definitely soak in the atmosphere on the way into the stadium. The pre-game march to the stadium is quite an event, with supporters gathering in a nearby park and streaming in massive numbers toward the pitch. (Their support for the national team is similarly impressive.) It is unbelievably loud inside, and the slow clap the fans do as the players take the pitch is one of the rare times I’ve genuinely gotten chills in a press box. Two things drive this rating down. First, CenturyLink Field is a massive football stadium, and the Sounders tarp off the upper deck for most home games. Though the fans in the lower bowl make plenty of noise, it’s still unpleasant to look at and detracts a bit from the atmosphere. Second, artificial turf is bad, and the Sounders play on it. What LAFC does have, though, is an absolutely spectacular stadium in a prime location in America’s glitziest city. Access: Getting anywhere in Los Angeles can be a slog, but Banc of California Stadium is at least in the middle of the slog. I drove in from Berkeley; it’s a day trip if you leave at 8 a.m. and are okay with arriving back in northern California at 2 a.m. For those of you who are not deranged, there’s always LAX. It’s about half an hour from the stadium and the city’s downtown by car. 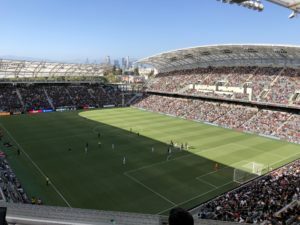 Things to do: Unlike Home Depot Center, LAFC’s home is closer to the center of LA. It’s in a complex right next to USC that includes the Los Angeles Memorial Coliseum and the California Science Center. The latter, in particular, is a good place to visit if you’ve got kids that you’re going to entertain before the match. (You can ask Dave Zeitlin about that one.) There’s also a cheesesteak place right across the street, if you want to enjoy what is presumably a poor imitation of the real thing. One oddity is that things kick off with a falcon swooping around the pitch. Falcons are not really that impressive, so it’s an odd choice. Though perhaps I’m spoiled by the Eagles’ bald eagle flyovers. How do you know you’re in LA? Well, there’s always the chance that Will Ferrell or any of the club’s other glitterati owners will make an appearance. And there’s a ground-floor club/restaurant where folks gather after the match. You can watch the home team’s press conference through a glass wall. (Nothing like gawking at a gaggle of goofy reporters!) Believe it or not, the club areas of the stadium were still hopping when I left the stadium 90 minutes after the final whistle. It is the most predictable soccer-hipster thing imaginable to conclude that Providence Park is the west coast’s best venue. It is also undeniably true. Portland’s crown jewel hits all the sweet spots. The stadium is historic and overflowing with energy. The soccer culture in the city is genuine and passionate. And the stadium is easily accessed from one of the most walkable and vibrant downtown areas in the country. Access: This is another stadium I drove to (only 10 hours from Berkeley! ), so I can’t offer much advice about the airport. (Make sure you get a better flight than the Union did.) Staying downtown will give you good access to the stadium without the need to rent a car. If you do want a car — maybe you’re taking the Mike Servedio approach and heading off to the woods after the match — your best bet is to park it somewhere downtown and not try anywhere near the stadium. I found a lot that was $5 for the whole day. 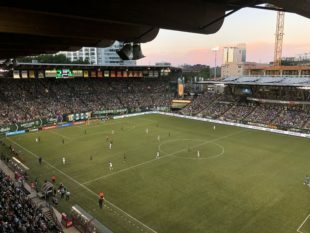 As the game gets closer, you can head over to Providence Park and soak in the atmosphere, including the unique profile that the stadium cuts into its surroundings. It’s also great that the Portland Thorns get equal billing on the stadium marquee, and I’ve heard that the crowd doesn’t drop off much for their NWSL matches. The game: Everything you’ve read about the Timbers Army is true. They’re insanely loud. They know what’s happening on the pitch. And they will spend the whole match braying for a middle-aged man with a chainsaw to do serious damage to a poor tree log. It’s worth getting there early just to watch that all come together. The only knock on the stadium is the artificial turf. Ultimately, that’s a minor complaint when you consider everything else Portland has to offer. If you’re willing to travel outside of downtown Portland, my wife and I flew into Portland earlier this year (not for the Union game) and drove east on I-84 through the Columbia River Gorge and around Mount Hood. Absolutely gorgeous scenery. It was back in 1960 on route 30, also. If I had only one or two places to be eternally linked to, Powell’s on Burnside St is one of them. I have spent hours and hours and hours in the Purple Room….discovering local writers over coffee and pastry. Blue Like Jazz, by a local Portland writer being one of my favorites. If you make the trip at just the right time seasonally heading around city on the way to Powell’s- coming down Burnside Canyon– Mt Hood presents through the canyon walls— overtop the skyline. Majestic. Powell’s is, without question, America’s best bookstore. And probably the world’s best bookstore. It’s absolutely jaw-dropping. The Strand in Manhattan, which is itself truly fantastic, can only be considered a distant second. nice summary, Peter. would be interested in similar reviews of the other far-flung or east coast stadia. i’d be interested in a USL take as well. some of them are very interesting. Glad you enjoyed it. I’m aiming to hit the center of the country over the next two years while I’m based in Colorado — Rapids, RSL, SKC, and Minnesota. looking forward to minnesota and i’ve heard good things about children’s mercy park. for what it’s worth, Mercedes Benz is amazing. lots to do and the atmosphere is excellent. Peter ranked this wit a turf field at top. that detraction aside, United have a crown jewel in the league. I can’t speak for any of the other stadia, but boy does Providence Park, fake grass and all, stomp the crap out of the game-day experience at PPL/Talen. I’ve been lucky enough to have reason to be in Portland when home games were on offer a couple times in the last few years. 1. Being able to walk to the stadium from a bar or restaurant, and vice versa after. 2. A supporters group so large, so loud and so invested, it was impossible not to get swept up in it myself. 3. No obvious catering to the bygone ideal of the soccer-mom demographic. If any of the above was true I’d still be a STH, or would at least manage to get to a match or two per season. It’s “Pike Place Market”, not “Pike’s Place”. When I visited Portland a couple of years ago, I found that my AirBnB was half a mile from Providence Park… and the Timbers had a home game. Against the Sounders. I was able to walk up to the ticket booth and get one of the last remaining tickets, which was right in front of the visitors’ section. The Sounders’ fans were so insanely loud the entire match that it ruined things for me a bit. However, there is no denying that Providence Park is a superb venue. I also saw the LA Galaxy at StubHub a couple of years ago with my kids, and was shocked and what a dumpy place it was, with such poor food & drink options. The gameday experience at Talen is far, far superior. I took a friend who was from Naples in Italy to see the Union play TFC (the 2-0 loss). He was blown away by the quality of the stadium and the in-game experience, and he’s a season ticket holder for Napoli. As soccer viewing goes, we have it REALLY good here, whether we believe it or not.